Temperatures are dropping. Wind chills are almost unbearable. Keeping up with a fitness routine is often a challenge this time of year. Here are some tips before you head out the door in these long, winter months. I’ve always been told to dress like it is about 15 degrees warmer than it actually is out. Overdressing can also become a problem, that’s why layering is key! Find a good moisture wicking base layer as cotton will only trap sweat and keep it close to your skin making you cold and miserable. Invest in a good pair of tights. Form fitting clothing will keep you warmer than loose, baggy pants. Don’t forget your hat and gloves! You lose most of your heat through your head and hands. If you get too warm, you can easily tuck hats and gloves in your pockets. Replenishing fluids is as just important in the winter as it is in the summer. It is easy to forget the need to hydrate after running in freezing temps, but your body is losing a lot of moisture trying to keep you warm. The UV rays reflect off the snow and can cause sun damage to your skin and eyes. Always wear sunscreen and a good pair of sunglasses. Try Yaktrax or other snowshoe device. I bought YakTrax over the weekend and after 2 runs, I asked myself why I didn’t get them sooner. Not only are they great for running in snow and ice, they will help when I’m out walking the pup. Don’t skip the warm up. 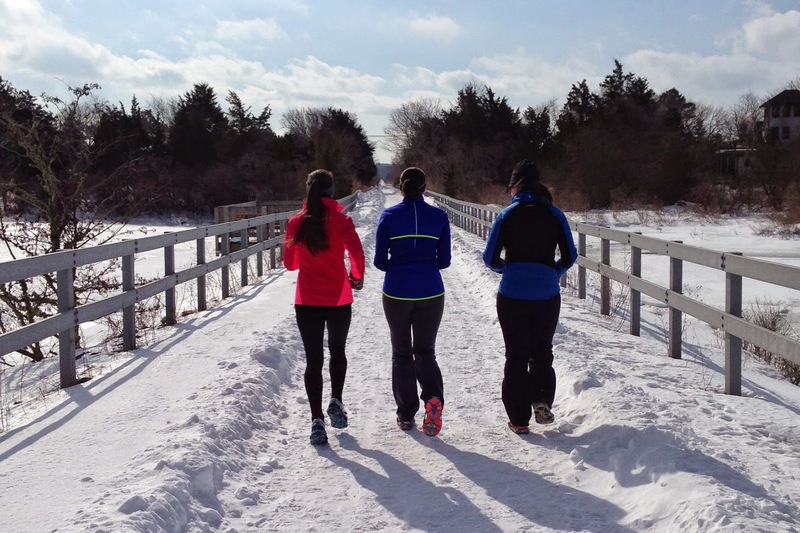 It takes your muscles longer to warm up in colder temperatures. Avoid injuries by spending more time warming up before trying to increase intensity and pace. Lower your expectations and expect slower times. With snow and ice on the ground, you are naturally going to slow down your pace. It’s actually a beautiful time of year if you take in all the sights around you. Go out there and have fun! Unless you are in training for a winter race, the winter should be about putting in the mileage and building your aerobic base. Save the fast running for the spring! Pay attention to what’s going on around you. I have always been terrified on slipping on ice and falling but this year Georgie and I almost got hit by a car because it hit black ice and accelerated towards us. 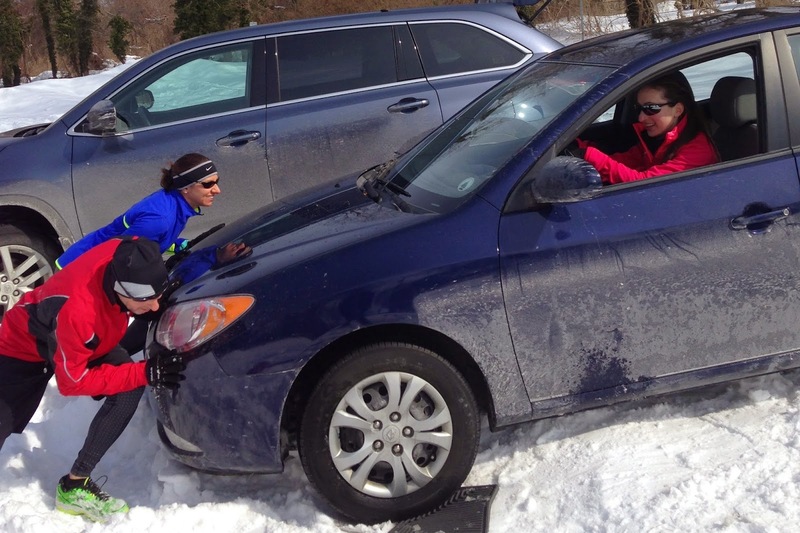 Find running buddies and always invite the friend with a shovel. 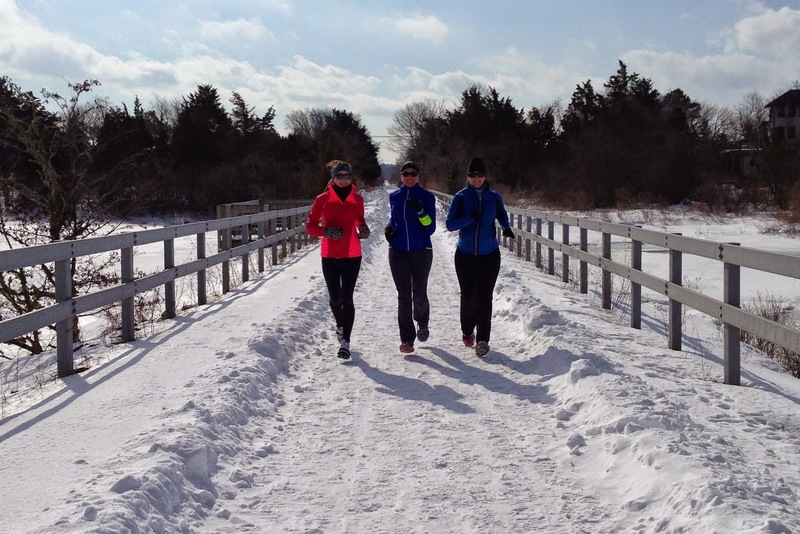 Running buddies are great for both motivation and safety. They are also key when your car gets stuck in the parking lot and need a push—aka impromptu post-run strength training session! When in doubt, hit the treadmill! Some days just aren’t worth the risk. 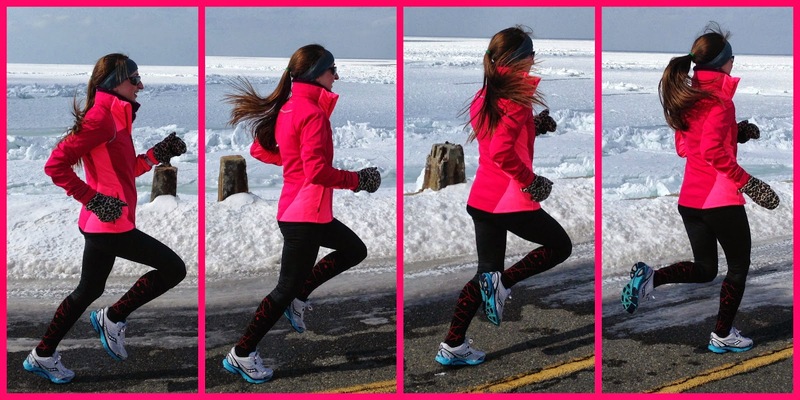 Whether its fear of ice or fear of hypothermia, take your workout indoors for safety and warmth. You can also try my cross training activity of choice… spinning! This was SO much fun! Jason and I keep saying how glad we were that we decided to go run in Falmouth, detouring and seeing the frozen Bay was totally worth it! We'll have to do it again soon!